In Egypt, More Clashes Leave 7 Dead, Hundreds Injured : The Two-Way Police clashed with supporters of ousted President Mohammed Morsi, just as the U.S. reopened its embassy in the country. Supporters of the Muslim Brotherhood and Egypt's ousted President Mohamed Morsi block the Six October bridge on Tuesday in the center of Cairo. 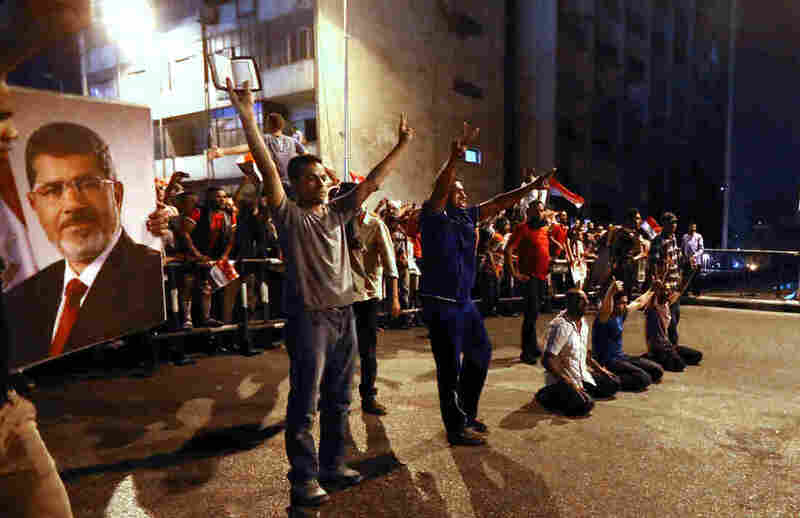 After what had been a week of calm, violence returned to the streets of Cairo late Monday into early Tuesday. "Police fired teargas and birdshot at protesters in Cairo's Ramses Square where supporters of the president gathered to demand Morsi's reinstatement. The Muslim Brotherhood-led marches went throughout the city in what protesters called a peaceful escalation. They put up roadblocks and used walls of protesters to cut off streets and bridges. "The bloody event came as Egypt's military-installed leaders are rushing to put together a cabinet and move forward despite the discontent. There are so far no Islamists in the proposed cabinet which is expected to be formed this week. The Muslim Brotherhood and its supporters are refusing to participate calling this military appointed president and his government illegal." The violence comes just as the United States reopened its embassy in Cairo. As USA Today reports, it also happened during the second day of a visit by U.S. Deputy Secretary of State Bill Burns, the first official U.S. visit since Morsi was overthrown. The newspaper says Burns' visit is intended to "underscore U.S. support for the Egyptian people, an end to all violence, and a transition leading to an inclusive, democratically elected civilian government." The New York Times reports that Burns delivered the "clearest statement yet on the military's ouster" of Morsi. "If representatives of some of the largest parties in Egypt are detained or excluded, how are dialogue and participation possible?" Burns told reporters, according to the Times. "It is hard to picture how Egypt will be able to emerge from this crisis unless its people come together to find a nonviolent and inclusive path forward."